A nearly full flight, 102 out of 108 ET seats taken, and 13 in Club out of 16 possible. Four MF cabin crew, but just the CSM operated CE, again from the galley. A319 G-EUPR. He was joined by 2 crew members after they had completed the BoB run. I was given a three way choice of smoked salmon, the cold meat and cheese plate or the quiche option. Here is the salmon, which the CSM thought had been loaded in error. Not the most generous serving of fish but fine for this flight duration, one of the longer Band 1 sectors. Had a LGW /NAP long flight the week before new catering then CTA / LGW on launch day so was able to compare Old with New. On the return the CSM was buzzing about gleefully announcing the new offering to all. No beer had been loaded but we have buckets of champagne he said also. I chose the same Beef curry main on both flights and I missed the smoked salmon starter which I loved. The little pot of olives chesse etc on the main tray is very poor for a band 4 flight. The wine in quarter bottles were better esp the white Sau Blanc and easier to acquire extra of from galley!! There was no pre meal drink service but this might be because it was a late night departure! I see the overall diff on these particular flights as being minor and if pushed preferred older service. Have CE flights ex LHR next month so can compare further. Prospero, corporate-wage-slave and calpelion like this. A nearly full flight from Gatwick to Edinburgh brings my flying week to an end. 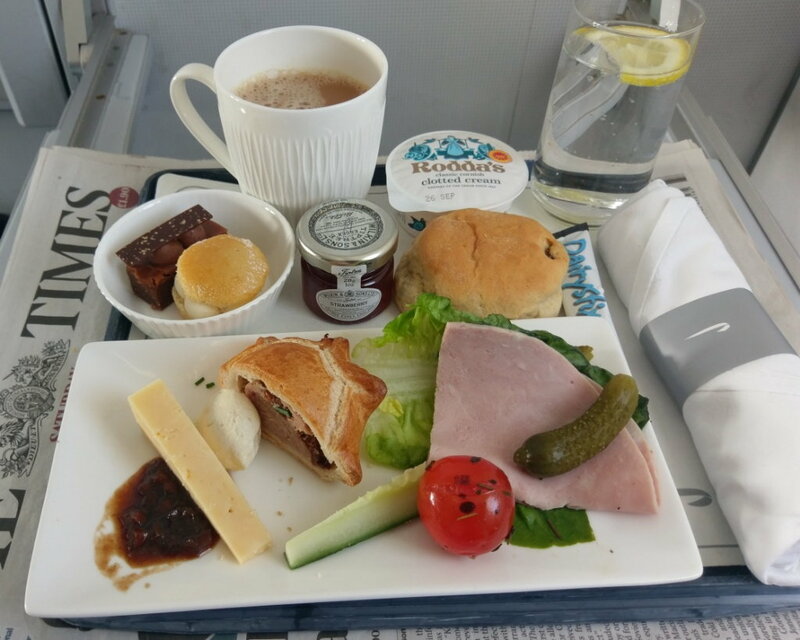 Gatwick uses Alpha Catering rather than Do&Co, and there are some differences. Three cabin crew for an A319 with 1 spare seat in Club, 3 spare in ET,. 19 passengers in CE with just the CSM serving. Unlike post 36 upthread, we definitely got the Rodda’s clotted cream, thank goodness. The choice was the same as LHR, sandwiches or Ploughman's. I went for the latter and as was the case previously the Scotch egg on LHR turns into a kind of sausage roll out of Gatwick. It's edible but that is the most enthusiasm I can muster. The scones aren't as good, but luckily they aren't the mini scones that LGW used to have some years ago, it's a full sized version now. They are drier and more crumbly than the Do&Co offering. There is less fruit in the LGW version, but for the plain scone the gap is smaller. Which also means there were plenty of scones left for “seconds”. Still it is a good improvement on the previous offering. Prospero and Jim72 like this. Nice to LGW Band 2 dinner flight. Will upload pictures whenever I can. Too many potatoes for my liking but 7 rows of club with two empty and two cabin crew serving. Drinks run at same time and one later one. A nearly full flight from Gatwick to Edinburgh brings my flying week to an end. Glad to see you actially get a day off to tend to the sheep! Isn't it pheasant season soon? Keep an eye out for a brace passing to the CSM soon! corporate-wage-slave and T8191 like this. After a Band 1 and a Band 3 today, and with the loss of the full starter on Band 3 which could be seen as a negative, I do see the changes as a step in the right direction. Breakfast on NCL-LHR was good. and the Band 3 lunch was more than substantial. 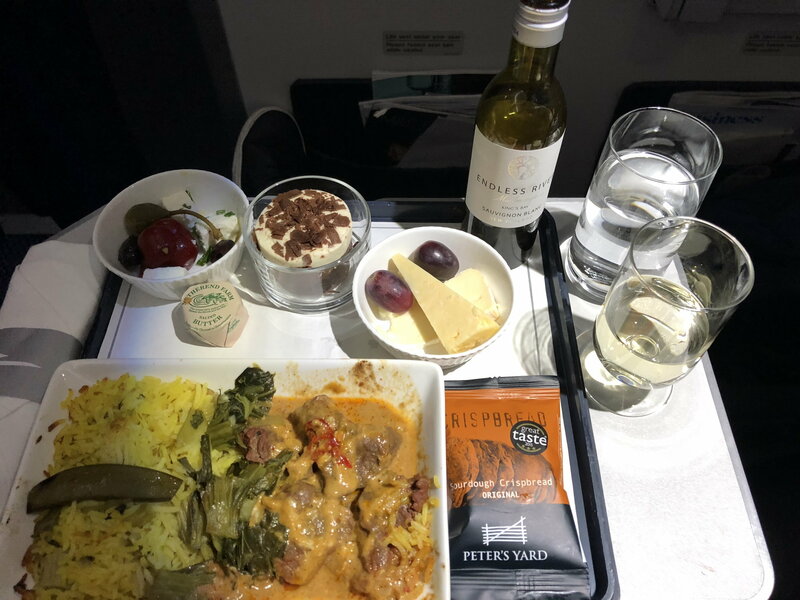 The Purser on the ARN flight was equally pleased with the changes (particularly the demise of the panini) and encouraged tasting both of the reds, which I do see as an improvement and now know to pick the Bordeaux over the Malbec for my preference. Prospero and Tobias-UK like this. I was actually expecting the salad option to be the last remaining option, so I asked when probably about the last 25% of the meal service if there was any salad option remaining for me to have a look at (not to eat - I'd already had mine). To my amazement, they had already run out of the salad option. It appears to have been pretty popular. (It was a Caesar salad with chicken.) The others were beef or vegetarian option, and beef seemed to be the most popular option although I suspect they loaded more beef than others. I honestly thought that the salad would be the least popular. Maybe the flight being at lunch time contributed to the popularity of the salad. I'm actually not surprised. My experience of the old CW service is that the main course salad was often running out. In other cases though, there were some left after the main meal and I managed to get one instead of the dreaded afternoon tea. 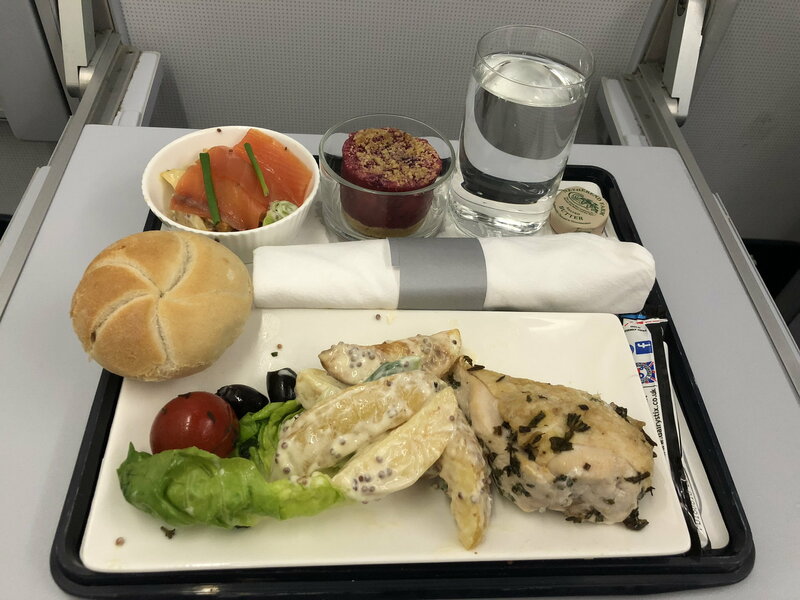 In fact, the salad is still often my choice in F but they are also a lot more substantia and even then I know they are polarising with people resenting only getting cold food on long flights. Moreover, in the old CW, it would almost never happen only one dish would be left and here, because there is always an element of randomness with relatively small numbers, I have no doubt there will be case where some people will have no other choice than the salad even though it will run out on some other services. LGW-ACE yesterday. Pretty full club cabin with 8 rows and only 2 empty seats. Crew were very good, one of the most proactive I've had in a while. It was slightly odd that the starter tray was served about an hour into the flight with the first drinks round. No nuts, just straight into the main event? I don't know whether this is because it's a lunchtime flight or whether it shouldn't have been done this way, but we did get nuts and another round of drinks about an hour before landing? Anyway, there were no menus and the main meal choices were chicken casserole, chicken arribiata or chicken pasta salad, so god help you if you don't like chicken! The chicken casserole was really tasty, one of the best CE meals I've had. And the chocolate cherry pudding was lovely. Bread was good, cheese was good but although tasty, the size of the antipasti starter was poor. One black olive, one green olive, a stuffed pepper, one caper and a couple of lumps of feta cheese does not make a starter! Wine was served in quarter bottles, 2 choices of red and 2 choices of white. Champagne served from full size bottles. The crew were complaining about wine glasses only being loaded on the trays, so if you wanted some later in the flight it had to be served in tumblers - something which CC seemed quite upset about! All in, we enjoyed the food but were glad we had eaten in the lounge! Prospero, corporate-wage-slave, T8191 and 2 others like this. First Band 1 dinner for me since relaunch on BA2765 AMS-LGW. A choice of chicken salad or feta salad. I opted for the chicken, with a starter of salmon on potato wedges in a (possibly) peppery dressing and some crisp spring onions. Strangely, the potato, dressing and spring onion from the starter made a second appearance on the chicken dish, with the addition of some lettuce, olives and a cherry tomato. Dessert was an apple and blackberry crumble, served in a genuine glass dish. I thought this was a little bland. New coffee mug, but the Union Coffee has not apparently made it to LGW yet. Overall, a step up from the last incarnation of CE catering to and from LGW with a decent-size piece of chicken that was definitely sufficient for a short evening hop, with a little bit of pasta and some soup a couple of hours earlier in the lounge in AMS. Prospero, orbitmic, corporate-wage-slave and 1 others like this. I note the starter there does look nicer and indeed a bit more substantial than the very small antipasti on the longer bands seen above. A side issue really but I find the pasta in the AMS lounge incredibly oily. Sorry no photos but most of the dishes have been shown already. 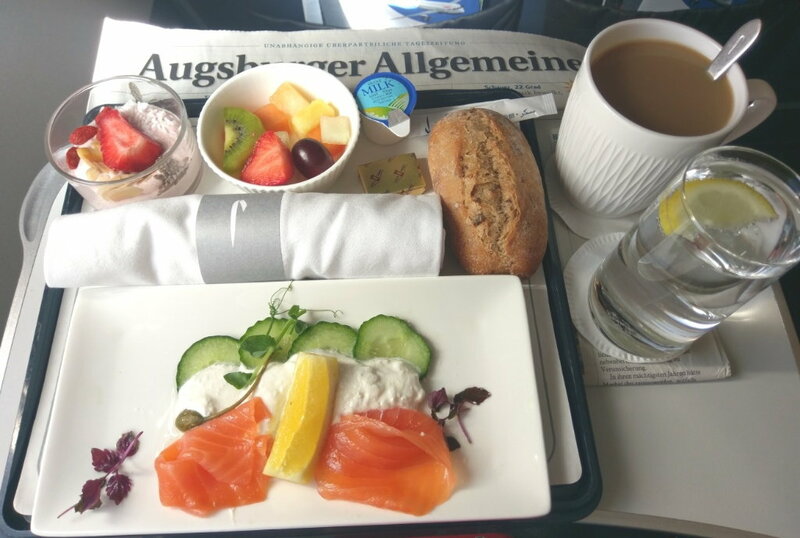 BA428 LHR-AMS this morning, breakfast there was a choice of Full English, Vegetarian Omlette or Salmon. I’m not sure cold cuts was mentioned as well? Anyway, I went with the Omlette which came with diced tomatoes, I think. Omelette had spinach in and tasted very good. Small pot of fruit which looks loads better than the sorry plate used to get. I was on a B-2-B and had a return ticket in economy on BA429. I got upgraded at the gate along with quite a lot of others I think. I wasn’t going to have anything but took one for the team and went with the Feta, Spinach and Mushroom quiche. Came with lettuce, an carrot and a yellow looking carrot (no idea what!) some broccoli and pickle. Very nice in my book. The other choice was the cold cuts. Both plate came with a pot of fruit and a yoghurt pot with raspberries and some seeds. What I was impressed about, with all the upgrades, it seemed to be fully catered. That’s rows 1-9 on a 767. There was maybe a few who declined I guess. Is it all about menu balance? Light starter, heavier main, sort of thing? I haven’t bothered to analyse in detail, just very happy with our Band 4 ex-MLA. All times are GMT -6. The time now is 4:54 pm.